Gov. Bruce Rauner speaks to a crowd of supporters on Nov. 4, 2014, the night he was elected governor of Illinois. Rauner has made criminal justice reform a priority. The Illinois Senate passed a bill Tuesday giving judges more control over sentencing and beginning a process to provide more funding trauma recovery services for violent crime victims. Both houses passed a bill addressing these measures, which is on its way to the governor’s desk. The bill works toward Gov. 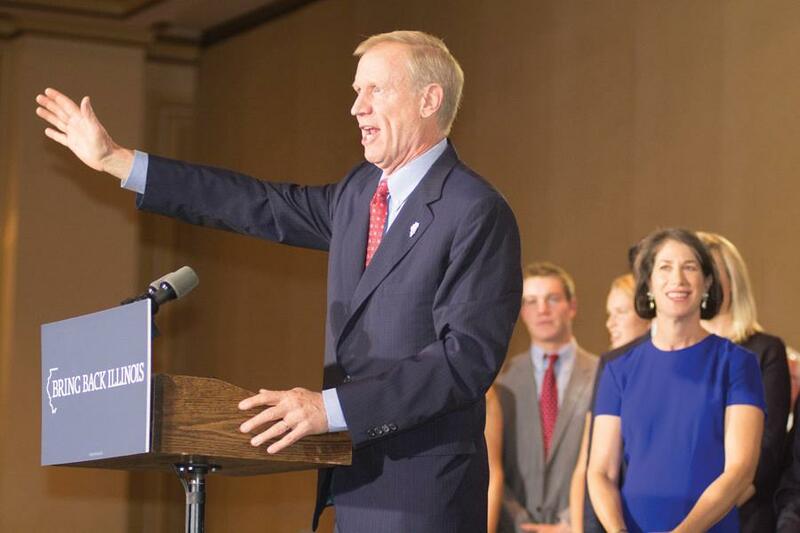 Bruce Rauner’s goal to reduce the Illinois prison population by 25 percent by 2025. The latest law is a step in the right direction, said Ben Ruddell, a criminal justice policy attorney for ACLU Illinois. Ruddell said funding for trauma recovery services, which aim to reduce the psychological impact of violence, is an important way to help end the perpetual cycle of inmates leaving and reentering prison. “The trauma that crime victims suffer is itself a compounding cost of crime that ripples and reverberates through people’s lives and communities long after the violence has occurred,” Ruddell said. Rauner established the Commission on Criminal Justice and Sentencing Reform through an executive order almost a year ago. The commission is tasked with finding policy solutions to reduce prison population. Trauma recovery is just one of many recommendations from the commission the Illinois General Assembly has acted on. The first wave of recommendations were submitted to legislatures last year and another 13 were submitted last week. Since 2015, the committee has called for changes in mandatory minimum sentencing laws for nonviolent drug offenses. The commission’s report also addresses long sentences that keep inmates in prison regardless of good behavior. Training on how to recognize implicit racial and ethnic bias for all people working in the criminal justice system is also emphasized in the report. Like Maki, Ruddell praised Rauner’s efforts and stance on fixing a “broken” criminal justice system. He said he looks forward to seeing Illinois politicians taking further initiative and acting on recommendations made by Rauner’s commission. Although Ruddell favored the bill, he said there is still work to be done to meet Rauner’s goal of reducing the prison population. He said that the bill could have gone further in keeping with the commission’s stance. For instance, Ruddell said Illinois politicians should have treated heroin and other opioids in similar fashion to marijuana and cocaine when writing legislations. Ruddell said that using law and order practices for heroin addiction is a mistake. While Ruddell, a Chicago resident, said efforts to decrease the prison population will do little to ease the high number of homicide rates in the city, the effort’s focus is on rebuilding communities.